Cap: The cap of A. argentea is 60 - 100 mm wide, hemispheric, becoming convex to broadly convex, lacking any trace of an umbo, slightly viscid, smooth, with a pectinate-striate margin; the cap is silvery gray or ash gray, and barely shiny. The flesh is not very thin, white, grayish under the pileipellis especially in the center. The volva sometimes covers the center of the cap with a large, thick white patch. 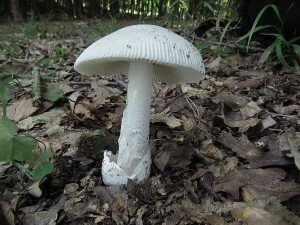 Gills: The gills are free, slightly convex, at first white, becoming silvery gray. 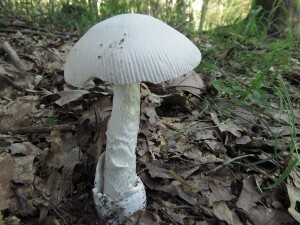 The short gills are infrequent and truncate. Steam: The stem is often as large as 140 × 17 mm, white above, grayish toward the base, exannulate, subcylindric and rather squat, widening slightly at both ends. The flesh is pale gray below and white above, with a central cylinder stuffed with material that soon develops horizontal cracks and eventually breaks up. The volva is ample, thick, membranous, whitish or spotted with pale tan on the exterior. Spores: The spores measure (9.1-) 10.0 - 13.5 (-17.7) × (6.4-) 7.5 - 10.6 (-13.6) ?m and are inamyloid and subglobose to broadly ellipsoid to ellipsoid. Clamps are absent or infrequent at bases of basidia. české shrnutí: Klobouk 6 - 10 cm široký, polokulovitý, konvexní až široce konvexní, mírně lepkavý, hladký, s rýhovaným okrajem, stříbřitě šedý, šedavý. Lupeny husté, mírně konvexní, nejprve bílé, později až stříbřitě šedé. Třeň 14 x 1.7 cm, zavalitý, k bázi mírně se rozšiřující. Výtrusy (9.1-) 10,0-13,5 (-17.7) × (6.4-) 5/07-6/10 (-13,6) um, inamyloidní, kulovité široce eliptické až eliptické. Tento druh byl původně popsán z Francie a patří spíše k druhům severoafrických a jihoevropským.